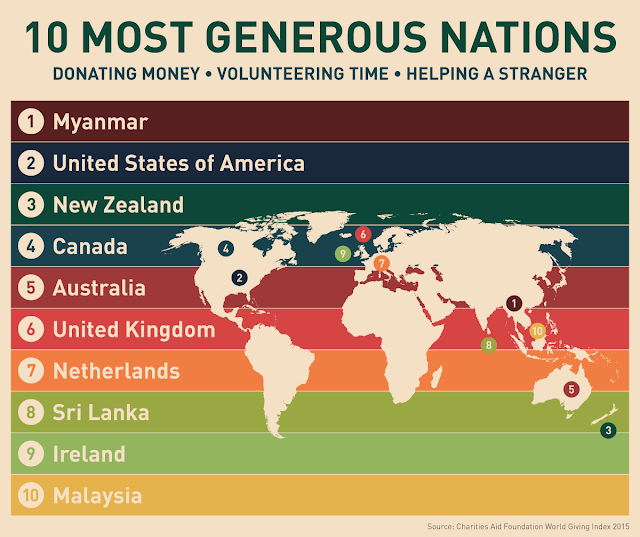 According to a recent report on global generosity, Nigeria ranked number 43 in the list of most generous countries in the world. Myanmar is the most generous country in the world followed by United States of America and New Zealand. 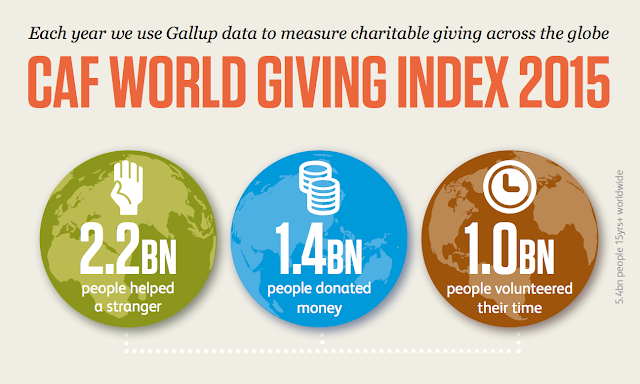 This was announced by Charities Aid Foundation in its report on the CAF World Giving Index. The World Giving Index score is based on an average of three measures of giving behaviour – the percentage of people who in a typical month donate money to charity, volunteer their time, and help a stranger. Now in its sixth year, the year’s report sampled 145 countries representing around 96% of the world’s population. Myanmar, the United States and New Zealand are the top three in the CAF World Giving Index 2015. Participation in donating money and helping a stranger has risen this year, whilst volunteering has seen a small downturn. For the first time in six years of the World Giving Index, we’ve found that men are more likely to donate money than women. Behaviour in a few very large countries has significantly impacted the numbers of people giving worldwide. Cultural and religious practices, as well as disruptive events, are at the root of a number of big changes seen this year. Despite their highly developed economies, only five G20 countries are in this year’s Top 20, reminding us that economic prosperity does not automatically lead to a rise in generosity.